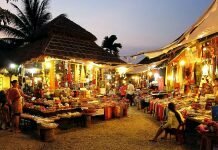 Sihanoukville is the most popular tourist attraction for those who love to enjoy holiday on the beach in Cambodia. 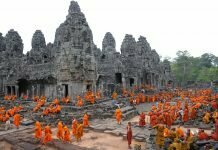 Featuring many exotic beaches, it is no surprise that most of best resorts in Cambodia are located in this city. 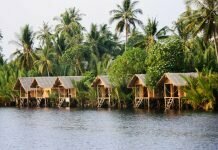 Here are top 8 beach resorts which have beautiful landscape and offer the best services you can choose for your vacation. Known as the best beach resort in Cambodia, the Sokha Beach Resort is set on a beautiful beachfront garden in Sihanoukville. The resort is divided into two types of accommodation: standard rooms and suite rooms which are well-equipped with full of amenities and private balconies overlooking the garden or the sea. The Sokha Beach Resort is uniquely designed with the main materials are wood and stone, bringing the warm and cozy atmosphere for guests. The Asean House serves buffet and a la carte menu throughout the day or you also can enjoy fresh seafood at Fisherman Village. Independence Hotel was built in 1962 and completed in 1963. 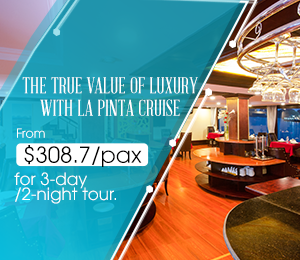 It has been considered as the most luxurious beach resort in Sihanoukville. All 88 rooms and suites in the resort are equipped with modern furniture that the guests can expect to stay in a 4-star hotel. There are also a private white sand beach, an outdoor swimming pool and a fitness center that attract a lot of tourists coming here to relax and have fun. Located in the new Otres Beach II of Sihanoukville, Mary Beach Hotel & Resort features modern rooms with private balcony overlooking the beautiful ocean or pool. In-room facilities include flat-screen TV, hot shower, minibar and safety box. Free WIFI is available in the resort. The Mary Beach Resort was built around the largest private beach of the island with the entrance gate only serving guests of the resort. The resort also offers an outdoor swimming pool and a modern spa. Visitors can book massage service on the beach and enjoy cocktail or fresh juices throughout the day. There are 4 luxurious restaurants serving French, Western, Japanese, Asian and Cambodian cuisine. Buffet breakfast is available and you also can choose to both enjoy coffee and watch the stunning ocean view in the indoor café shop of the resort. It only takes about 5-minute walking to reach the gorgeous Ochheuteal Beach and Beach Club Resort – one of the premier mid-range hotels in Sihanoukville. All rooms in the resort offers pool view and are well-equipped with modern facilities and services. The Beach Club Resort will definitely be an ideal base for tourists to explore the beautiful Sihanoukville coastal city and Cambodia. La Reserve Hotel is located near Sihanoukville city center. The hotel was built in 2006 with 16 rooms. Each room has full of basic equipment such as air conditioning, wireless internet and TV. The hotel’s facilities include a bar, restaurant, room services and outdoor swimming pool. Reef Resort is the first beach resort built in Sihanoukville with 9 luxury double rooms, 4 family rooms and an apartment surrounded by swimming pool. In-room amenities include air conditioning, fan, mini-bar and free WIFI. The restaurant serves Mexican, Western and local food and drink which are prepared by four experienced chefs. 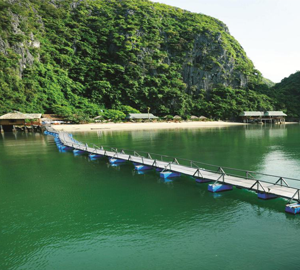 The Koh Thmei Resort is definitely an ideal place to relax for your holiday. Inaugurated in December 2010, the resort features many bungalows designed with wooden walls and beautiful roof. Koh Thmei is nestled in the Ream national Park where you can enjoy the fantastic natural landscape, fresh air and quiet atmosphere of the pristine island. Tranquility Guesthouse boasts a convenient location in Sihanoukville and modern amenities in every guest rooms. All rooms have private balcony or terrace. Offering convenient location and a variety of services and facilities such as restaurant, bar, the Tranquility Guesthouse is one of the smart choices for you to stay in this city.